Dressed in a Platinum Tint, Sail and University Red color scheme. This Air Jordan 11 features a Sail mesh upper with a Platinum Tint patent leather overlay. University Red contrasting accents, Black detailing around the inner collar atop a translucent outsole completes the design. Look for the Air Jordan 11 “Platinum Tint” to release on October 27th at select Jordan Brand retailers and StockX. The retail price tag is set at $220 USD. 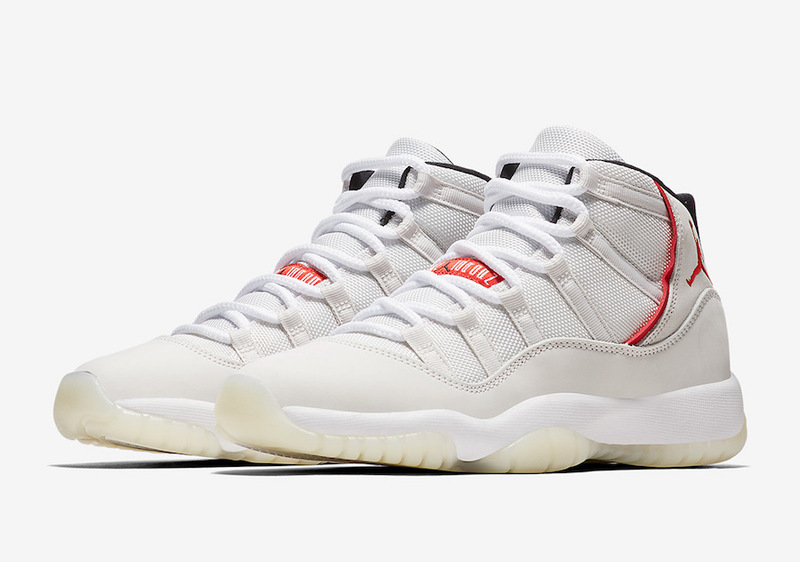 UPDATE: Nike releases official photos of the “Platinum Tint” Air Jordan 11 in Grade School sizing. UPDATE: Nike releases official photos of the “Platinum Tint” Air Jordan 11. UPDATE: Detailed photos of the “Platinum Tint” Air Jordan 11 via FineLine1721. UPDATE: New photos of the “Platinum Tint” Air Jordan 11 via @chicagoemporium. The colorway will release on October 27th.